Everything is better with bacon, including vegetable side dishes. 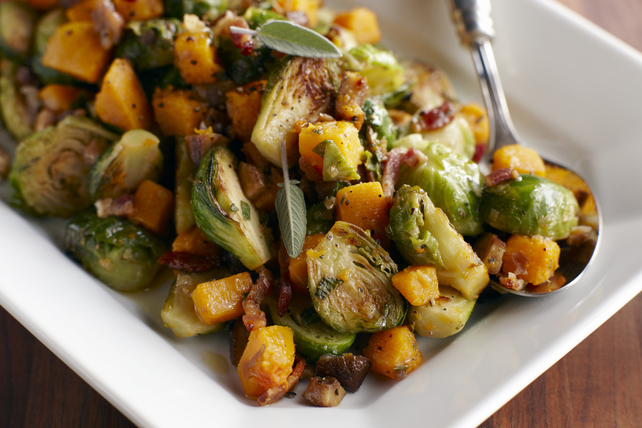 Our Roasted Brussels Sprouts with Squash and Bacon recipe is a side dish that the entire family is sure to love. Toss vegetables with dressing; spread onto foil-covered rimmed baking sheet sprayed with cooking spray. Place bacon next to vegetables on same baking sheet. Bake 20 to 25 min. or until vegetables are tender, stirring vegetables and bacon after 12 min. Spoon vegetables and bacon into large bowl. Add sage and pepper; mix lightly. Remove any loose or yellowing leaves from stem of each sprout. Trim and discard ends of stems. Rinse sprouts, then drain before using as desired.